The Sanguine Gryphon Skinny Bugga! 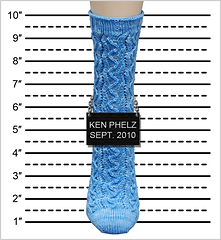 Crafty Detour presents the the fourth sock in the Criminal Sock Investigations E-Book. 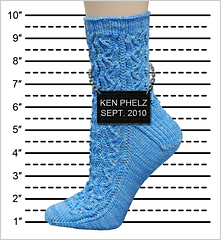 Ken Phelz: A lacy, toe-up sock criminal - Out to felt your hand knits into submission. 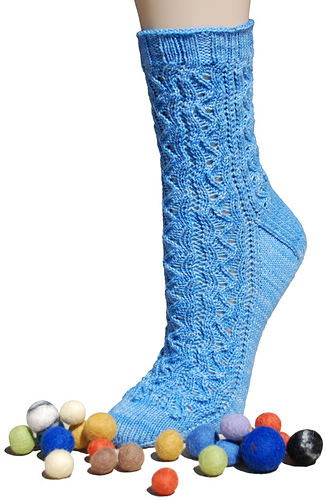 These socks are worked from the toe up on two circular needles. If you prefer, the socks may be worked using the Magic Loop technique or on double-point needles. This pattern is written such that both feet are the same. To make them mirror images, work the one foot as written. Work the second starting the chart on round 7. Both chart and written instructions are included.